On March 22, 2018, and a month before the 20th anniversary of the Good Friday Agreement, out Worthy President Judge James McKay testified before the Helsinki Commission on Security and Cooperation in Europe. The Commission, at the behest of Co-Chair Chris Smith of New Jersey, was holding a hearing, “The Good Friday Agreement at 20: achievements and unfinished business,” to review the status of the implementation of what panel member Congressman Brendan Boyle described as the “unquestioned gold standard in terms of peace agreements.” However, both Congressman Smith and Boyle both expressed their concern that lack of significant progress in implementing key provisions of the agreement and the new challenge posed by Britain’s desire to pursue Brexit could imperil the agreement and the peace it has established. 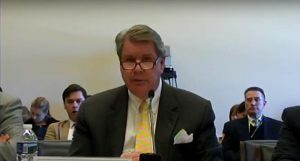 Judge McKay appeared before the committee with fellow witnesses Brian Gormally, Director of the Committee on the Administration of Justice, and Mark Thompson, Director of Relatives for Justice. The Judge also noted the failure to honor the Good Friday Commitment to address the legacy of the past, noting “[addressing] ‘legacy issues’ is critical to finding a path forward.” Judge McKay noted that there appears to be an on-going double standard of justice; that if Civil Rights Campaigner Pat Finucane’s murder had occurred in London as opposed to Belfast there would be no hesitancy to conduct a thorough investigation and transparent hearing. The hearing concluded with Congressmen Smith and Boyle indicating their deep concern for the Good Friday Agreement. Congressman Boyle stated, “This is a very disturbing backsliding the likes of which we have not heard for the previous 19 years.” Congressman Smith stated that he has introduced H.Res.777, which calls for the United States, the British and all parties, including the Republic of Ireland, to recommit to the peace process.